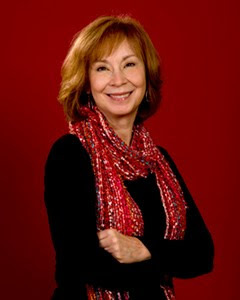 Diane Chamberlain is the bestselling author of nineteen novels. She lives in North Carolina with her significant other, John, and her two Shelties, Jet and Keeper. 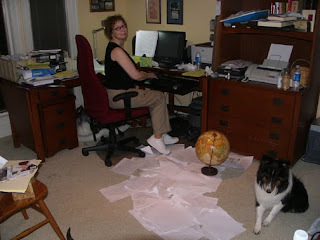 I'm grateful to Kaye for helping me celebrate the release of my 19th novel, The Lies We Told with a guest spot on her blog. I'm going to use this opportunity to share my book trailer with all of you and also to give you a small peek into my writing process. Welcome to my world! The trailer was created by my significant other, photographer John Pagliuca, and yours truly. We wanted to capture the feeling of the book instead of trying to tell the story itself. I did the narration, reading from the very first page of the book. It's a huge challenge to create a book trailer, but we had a good time putting it together and I hope you enjoy it. People ask me how many drafts I write when working on a book and I'm never sure how to answer, so this time I counted. The answer? Six. I'm tired just thinking about it! The picture of my office was taken somewhere toward the end of the fifth draft. What a mess! I thought I'd demonstrate how those drafts differ from one another by sharing the same paragraph from an early draft, a middle draft, and the (almost) final draft. We are in Maya's point of view in the scene below. I hope that seeing the first draft will encourage those of you unpublished writers who think you have to write something perfectly the first time! A guy walked into the restaurant. She noticed him the second he walked in. there was something about him. the way he scanned the restaurant. unsmiling. a flare to his nostrils that reminded her of ___. His eyes came to rest on the two men at the table next to her and Adam's he walked toward the table with a deliberate stride, and she watched him pull a gun from his jacket pocket and before she could scream or duck or even widen her eyes, he'd shot the man at the table in the head. Everyone screamed then. She had a lot of company. Adam said something to Brent and Rebecca, but I didn't hear him. My gaze was on a man who had just walked into the restaurant. He was dark-haired, wearing a white t-shirt and beige pants and he stood in front of the door, looking from table to table. There was something about him that sent a shiver through me. He started walking toward us--or at least, I thought he was heading toward us. Then I saw that his gaze--his ice-blue eyes--was on the two men at the table adjacent to ours. Adam said something that must have been funny, because Brent and Rebecca both laughed, but I'd set down my fork and was beginning to tremble, my heart thudding beneath my breastbone. I knew how quickly these things could happen. He reached behind his back, then whipped his arm out straight, the gun a gray blur, and I saw the small symbol tattooed on his finger as as he pressed the trigger. Adam said something in response, but I didn't hear him. I was watching a man who had just walked into the restaurant. He was Caucasian, dark-haired, wearing a white t-shirt and beige pants, and he stood in front of the door, shifting his gaze quickly from table to table. Something about him sent a shiver through me. He started walking toward us--or at least, I thought he was heading toward our table. His stride was deliberate, his nostrils flared. Then I saw that his eyes--his /ice-blue /eyes--were locked on the two men at the table in front of ours. Adam said something that must have been funny, because Brent and Rebecca both laughed, but I'd set down my spoon and was gripping the corner of the table, my heart thudding beneath my breastbone. I knew better than anyone how quickly these things could happen. He reached behind his back with his right hand, then whipped his arm out straight, the gun a gray blur as it cut through the air, and I saw the tattoo of a black star on his index finger as he pressed the trigger. Imagine 400 pages of this! No wonder I'm so tired when I finish a book--tired but excited. I hope you've enjoyed this little peek into my world. I'll pick one of the commenters to this post at random to receive an autographed copy of The Lies We Told. Good luck! I'm really excited to read this book soon. I enjoyed the trailer (lovely, lovely) and also the guest post by Diane. I have this on my Kindle, so you don't need to add me to the giveaway. Thanks for sharing this with us, Kaye! Thanks for the peak, sounds like a very intriguing book. I can understand why you would be tired, but excited. Best of luck with your book. Kaye, thanks for introducing me to a 'new to me' author. Great trailer. All words in all novels tell a story, but it's the feelings they evoke that separates the good from the bad. I appreciate your goal for the trailer, and applaud what I consider a unique success. 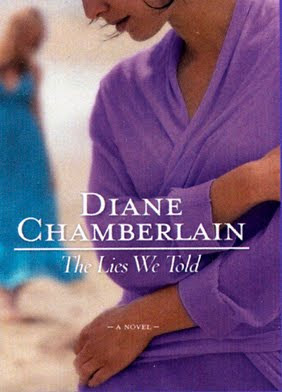 I am not a great fan of audio books, but if you were the narrator, I would listen to all of "The Lies We Told." I love introducing you folks to new writers! And I think you'll love Diane's books. Diane - thanks for dropping by. Wish I could have gotten to Raleigh, but maybe next time!